To make or become stronger or more intense. “The path of temporality would barely leave more trace than aging flesh if it was not useful to nourish our relationship with space”, – writes Emilio Lledó. He clarifies that it is here where man has managed to capture its presence in the real world, as well as language giving form and content to the ideal world. Our presence leaves its mark; a footprint that breathes more slowly. It follows its own beat even if the housing bubble burst, dragging standards and evicting functions, as in Almar, the old factory building of ceramic material. The once gleaming industrial infrastructure has become obsolete. The factory is located at a strategic point for territorial recovery. It is part of a communications system connecting two existing routes in the Vallès: the biological corridor and greenway. Traces that already suggest the binding intention of the land. The proposal is the connection of the two natural parks of Collserola and Sant Llorenc del Munt by a cycling network that complements the existing forest and agricultural area. Resistance and defence against urban sprawl by its own fabric. Time suggests the need to continue over the indelible mark of speculative actions of the territory. Although the past will always be ours, it is no longer what it was. Inevitably, a new perspective arises that changes the sequence of actions. Among injecting and reconverting, there are an infinite amount of actions possible. While the first speaks about osmosis between the old and the new; the second offers us the past as material for kick-starting future possibilities. Warehouses are studied from various levels to propose an infrastructure that can grow as needed. Meanwhile, the action is concentrated on a narrow strip, allowing the effect to multiply. The prefabricated concrete structure of the original warehouses is reinforced for the new ramp that descends, defining a space that will become the central atrium of the project. We can not control the effects of time but we can limit the decay by finding the true nature of the materials. In Almar, our accomplices are now topography, warehouses and clay. Soil, already transformed since it is also a clay source, had an industrial value that the proposal uses to place a bike park. The warehouses are considered a disposable material once the activity for which they were conceived disappears. They are the fossilized imprint for the future. Time as matter is forgiving and unifying. It does not let us forget but allows us to move forward. Clay is a pact with it, end and beginning. With the material stock left without output, we will build new volumes. 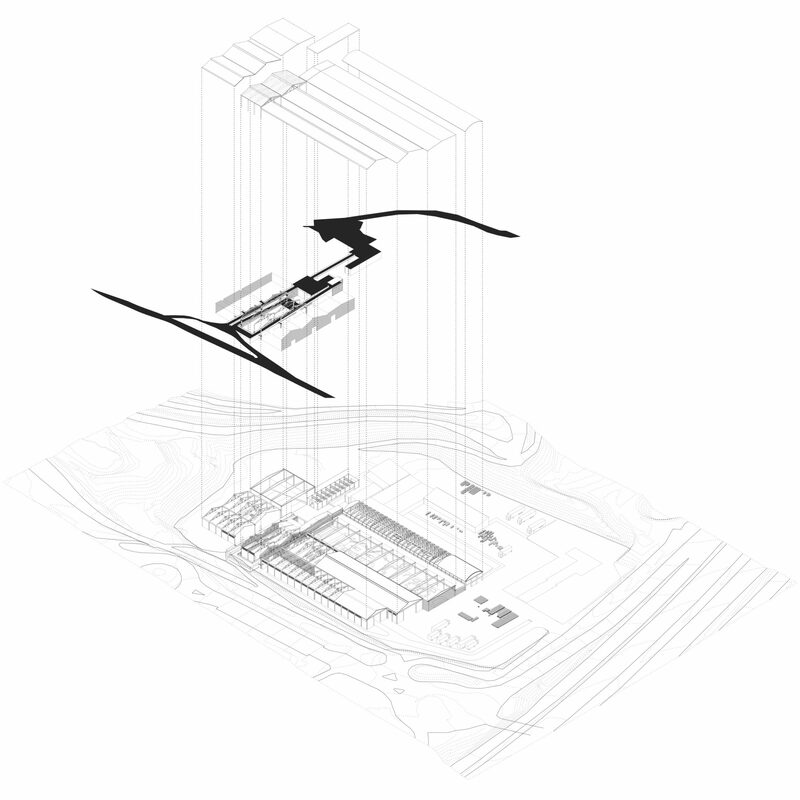 The cosmopolitan nature of the proposal for Almar is the ability to fluctuate between new and known. A previously imperceptible link between their fragmented qualities that lets new life arise. Colonizing or building is to choose between invasion or respect. Build is not a dirty word. It lives sheltered in its inviolable definition, which speaks about strength and intensity. So happens always, someone holds out a hand in a gesture that is not appreciated in this moment of time, but it will last longer than we could imagine. Building is a verb that has spent years seeking refuge, and now descends slowly the ramp of Almar or, unaware of the disaster surrounding it, pedals over the old quarry.